Holiday season is upon us and millions of people across the UK will be preparing their Summer beauty bag and travel health essentials. However, nearly half of those surveyed in the new poll were not aware of the need to protect a scar from the sun’s rays, rising to 56% of over 65-year-olds. There appears to be confusion about treating scars, with 19% of people most likely to use water, 35% choosing Aloe Vera, closely followed by Vitamin E (22%) and even butter (5%). In fact, silicone treatment is the first line, gold standard treatment8 to improve the physiological and cosmetic appearance of hypertrophic and keloid scars – something only 7% of those surveyed were aware of. “While people’s general knowledge of sun protection has grown dramatically in recent years, this survey shows there is a real lack of understanding of how UV can aggravate the healing process of scars. Scar tissue has poorly functioning melanocytes, the body’s natural protection against UV, so it is very important that you protect a scar from the sun’s rays – at home or abroad. Scar tissue is much more susceptible to the sun’s rays than regular skin and should be protected from UV exposure until the pink/red colour has subsided which can take up to 18-24 months in some people. Water loss and collagen production following surgery or injury are greater than normal and can lead to excessive scarring. So, for example, if you’ve recently undergone a cosmetic procedure such as a breast enhancement in time for the Summer season or had a C-Section, scar after-care should be top of your list. However, 60% of people surveyed didn’t realise that common cosmetic surgery procedures require scar after-care. Although anyone can develop an abnormal scar, the risk factors for these are greater for darker skin types such as people from Africa and African Caribbean and south Indian communities, younger people between the ages of 10 and 30 are more likely to develop keloids5,6 and people going through hormonal changes such as pregnancy or puberty7. Silicones are the gold standard therapy for the prevention and treatment of hypertrophic and keloid scarring and work by forming a breathable, waterproof sheet over the affected area to act like an extra layer of skin. This invisible sheet binds the outer layer of dead skin cells to protect the underlying tissue against chemical, physical and microbial invasion of the scar. It also provides an optimal healing environment by hydrating and protecting the area and allowing collagen production to normalise and improve the appearance of scars. Skin is actually the largest organ in the human body, shielding us from extremes of temperature, damaging sunlight, and harmful chemicals. It is the protective covering, the first barrier to fight illness and disease, and a passageway to the bloodstream. Therefore, scar safety is vital throughout the summer months, whether it’s the need to protect flat scars, C-section marks or burns. Silicone is the main ingredient in many topical scar treatment products and has been used for more than 30 years in the prevention and treatment of scars by plastic surgeons and other healthcare professionals to treat abnormal scarring such as hypertrophic and keloid scars. Kelo-cote® Scar Gel UV with SPF 30 is an advanced formula silicone scar treatment, clinically proven to help soften and flatten raised scars as well as reducing discolouration and redness, protecting visible scars from the effects of the sun. The Kelo-Cote® formula also binds to the skin’s surface creating an ultra-thin sheet which can give treatment and protection for scars for 24 hours per day. Once dry, sunscreen and make-up can be applied over the treatment area. It is recommended that sunscreen is reapplied regularly. The only silicone scar treatment in the UK with SPF 30 UV protection – KELO-COTE® Scar Gel UV with SPF 30 – is available to buy over the counter at selected pharmacies and from Amazon. 1. An online survey was conducted by Atomik Research among 2,000 UK adults. The research fieldwork took place in May 2018. Atomik Research is an independent creative market research agency that employs MRS-certified researchers and abides to MRS code. 2. Signorini M, et al. Clinical evaluation of a new self-drying silicone gel in the treatment of scars: a preliminary report. Aesthetic Plastic Surgery. 2007;31(2):183-7. 3. Kerwin LY, et al. Scar prevention and remodeling: a review of the medical, surgical, topical and light treatment approaches. International Journal of Dermatology 2014;53:922–36. 4. 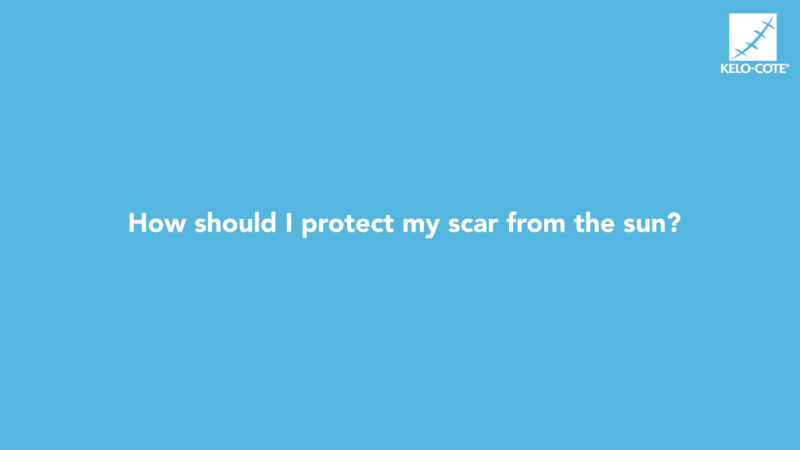 NHS Choices: Emotional effects of scarring. Available at nhs.uk/conditions/scars/#emotionaleffects- of-scarring Accessed 29 November 2017. 5. NHS Choices nhs.uk/live-well/healthy-body/keloid-scars Last accessed: May 2018. 6. Bayat A, et al. BMJ 2003;326:88–92. 8. Monstrey S, et al. Updated Scar Management Practical Guidelines: Non-invasive and invasive measures. Journal of Plastic, Reconstructive & Aesthetic Surgery 2014;67:1017-25.